SOC – The Lone Peak Celebration. Food, Music by Eric McKenna Spreng and Shawn Vincent, live and silent auctions, and a presentation by Black Diamond President and activist, Peter Metcalf. Cactus and Tropicals, Patagonia, Voile, Black Diamond, The Beer Nut, Wasatch Touring, REI, Salt Lake Acting Co., Petzl, The Green Building Center, Teva, The King’s English and More! Please join friends of Matt and local chefs for an evening of fun and great food. Come see Kimball Distribution’s beautiful kitchen showroom and watch the cooking masters in action. Discover unusual silent auction items while enjoying all-star musical entertainment from the students of The Paul Green School of Rock. Citizen’s Comp at The Front Climbing Club. 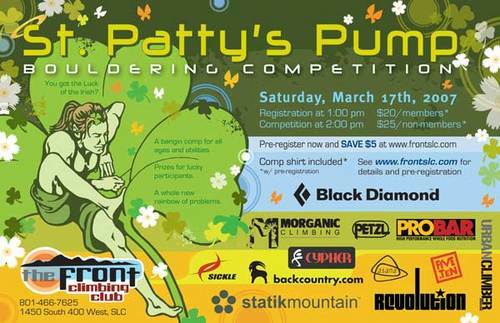 Don’t forget – the St. Patty’s Pump is this Saturday. We have more schwag than we know what to with. So, come climb on all new problems, get a sweet event t-shirt, and score some quality merchandise from our sponsors. As always, comps at The Front are fun for all ages and abilities. And, it’s the last comp of the season and a good way to meet new climbing buddies for the summer. ps – thanks to everyone who voted for The Front for City Weekly’s “Best of Utah” competition. If you plan on going to Triassic, read this thread. I just spoke to the President of the mining company, LiveEarth, and Russell Taylor, the person who first contacted Gorilla regarding Triassic. They are really nice guys, and are willing to continue to allow access out at Triassic. Their company mines humic acid, used for fertilizer and other products. From the sound of it the mining will not interfere with any of the climbing, as they are not interested in any areas where there is rock. I am going down next week to meet with them and figure out exactly where they will be mining, where we should start parking, etc. The main thing they are concerned about is liability and damage to their equipment. While under Utah law they are essentially shielded from liability with respect to any injuries on their property, they were somewhat concerned about “monkey wrench” tactics used on their equipment. We need to make sure and get the word out that any of this type of behavior from the climbing community would seriously threaten access to the area and is unacceptable. The president of the company, David, could be interested in eventually selling or leasing the land. This may be something to explore further with the Access Fund and others. He seems like a great guy, and told me he has always been concerned with environmental stewardship in regards to his mining sites. He also mentioned that if we needed any work done on the roads down there he would be interested in helping out. I will update the site on any further developments, particularly after I go meet with them next week. In the meantime, please try and get the word out as far as what is happening down there so no problems arise while we try and negotiate this delicate situation. I represent the mining company that is currently operating on the private parcel of land you refer to as Triassic. This site is now an active mine site. Access will not be an issue given there is no desturction of mining property and waste is picked up. As a part owner in the company and land steward we encourage multiple use of land. Given that this is a private parcel we do need to have a talk about what is written in your publications about inviting other to this property. My direct email is russt -A T- livearth.com please send all correspondence there. Keep your calendars open for May 3rd. Don’t be a loser, come out and support the SLCA, road trips can wait. March 17th at The Front. 1:00 PM check-in, 2:00 PM comp. It turns out there is a conflict on March 23, with a Weber Pathways fund-raising event. The Ogden Climbing Parks meeting will be held Saturday evening, March 24th, at 5:00 pm, at the Ogden Nature Center. Please inform your readers of this change, and extend my apologies for any inconvenience. Your readers will be interested to hear that they are invited to a meeting at the Ogden Nature Center, Friday, March 23, at 6:00 pm. Jeff Lowe, Director of OCP will present the groups’ ideas and vision for improving and securing access to crags in the Ogden area, as well as plans for the artificial ice tower, and ice farming in Waterfall Canyon. Water, juice and beer will be served. Please come and add your perspective. The email was indeed solicited, I had emailed Jeff about keeping me in the loop regarding the Ogden Climbing Park. I also implied that any discussion was valuable – both good and bad. You are currently browsing the Utahclimbers.com blog archives for March, 2007.